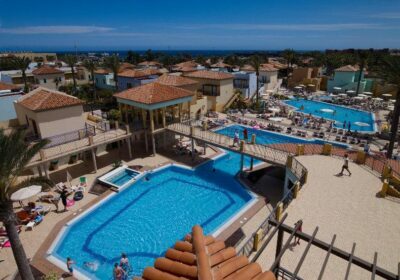 Is you are looking for a Good Value for Money Holiday without any frills then choose the Broncemar Beach Aparthotel from £31.59 p.p.p.n. All Inclusive. Broncemar Beach Aparthotel is a new type of hotel, built like a small village with each apartment being its own little house. The complex offers a relaxing friendly environment suitable for all holiday makers. All of the 252 apartments are beautifully decorated and fully furnished and equipped with a kitchenette with utensils, satellite TV, telephone and either a terrace or balcony offering guests great views of the surrounding area. There is a wide selection of facilities and services available to guests which include 24 hour reception, money exchange, laundry service, luggage storage, internet access and a supermarket. There is a swimming pool, loungers, parasols, sun terrace, childrens swimming pool, childrens playground, tennis court and a jacuzzi. There is an entertainment programme for both adults and children. Further facilities include a restaurant and a bar. Please note there is a charge, payable locally, for the kids club.